Grosfillex produce the most sublime appearances regarding PVC storage sheds – PVC summerhouses. Exhibiting mellow pastel shades and deeper tones their designs blend into any garden’s landscape with pure finesse boasting weather-resistance and virtually maintenance-free advantages. 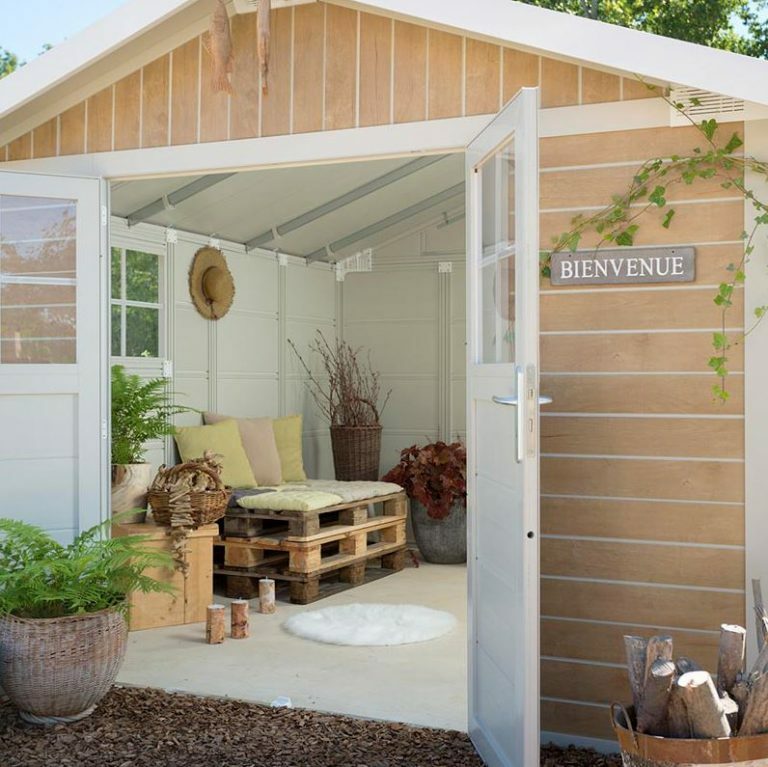 Grosfillex are a French manufacturer developing contemporary shed designs with sturdy build quality. Their PVC panels wrap and secure around a reinforced steel infrastructure, anchorage determines their stability whilst feedback received is quite exceptional. What can a Grosfillex shed be used for? 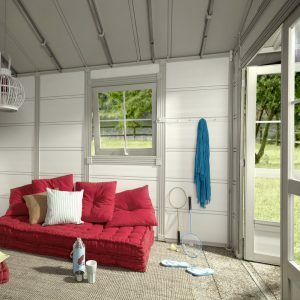 Their usages are pretty much unlimited as their designs stretch from the smallest model occupying approximately 2.76 m² followed by stepping up the range in 4.90 m² – 7.5 m² and 11 m² sizes up to the largest summerhouse measuring 19.6 m². Whether intentions are to accommodate the usual paraphernalia common to garden shed services, a resting place a stroll down the garden, a peaceful art studio away from indoors, situated poolside serving swimming requirements, a bright and airy home-office, a man-cave’s escape route, a she-shed’s getaway, a contemporary potting shed, a fab kids games room, the list is simply endless and quite diverse. 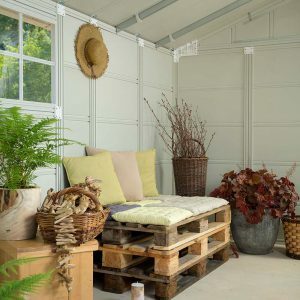 What’s your idea – Garden shed? summerhouse? Escape route? Strangely enough, the lack of a built-in floor benefits a Grosfillex shed, they are purposely designed without due to their diverse usage potential enhanced by customizable features to aid creating one’s own divine personal out-of-the-home retreat. A thickset heavy-duty resin floor common on all quality plastic sheds isn’t particularly suited for living accommodation. Grosfillex prefer you to fit your own choice of flooring dependant on your accommodation desires and services required. If traditional shed services are intended then concrete or wood decking provide and ideal base however if preferences are to design an outdoor kitchen dining summerhouse situated within a BBQ area or serving as a beach hut for swimming services etc, a floor laid with attractive easily-cleaned non-slip floor tiles make sense. If however, intentions are to create a home-office, games room, art studio or design your own garden’s most luxurious hideaway retreat isolated from home-life’s busy surroundings, then perhaps desirable wood-flooring or stylish floor-tiles to match one’s decor and seating fabric determines requirements. There’s a one-step ruling required in preparing the perfect resin shed or summerhouse foundations, its making sure they are solid and level. A level base eases the assembly process dramatically as the facade panels and doors align with ease plus the perpendicular shed stance averts leaning stresses to one side of the shed generating a flawless construction. Grosfillex advise to lay concrete foundations at least 10 cm thick for the larger sized models, thus further increasing their stability. Many Grosfillex summerhouse assemblers increase their foundations area around the outer perimeter of the shed especially in-front of the doors opening, creating a decked or patio area for seating outside their summerhouse frontage delivering the best of both worlds regarding indoor/outdoor seating accommodation. Constructing a Grosfillex shed regards securing the metal-rail base perimeter trim to the corner posts whilst anchoring them down onto the solid level foundations. The PVC sheets simply slot, slide and secure into the vertical metal framework, a series of steel struts which secure into the base perimeter down below and metal roof infrastructure up above producing overall rigidity to the final construction. Recommendations regarding exposure to high winds relate to strengthening the shed’s anchorage system by virtue of an additional anchoring kit, a straightforward installation regarding a series of steel cables consisting of clamps, links and tensioners that inconspicuously secure the anchorage within the corners on the shed. Each PVC sheet encompasses a dual walled resin lining equating to 26 mm thick panels, each consisting of a grooved edging conformation enabling a straightforward slot-into-place assembly procedure whist securing with the vertical struts and adjoining facade panels delivers their rigidity. The PVC’s resin mix and molding procedure creates a semblance of horizontal or vertical wood panelling dependant on shed model whilst new design techniques regarding heliographic printing processes exhibit a textured grain effect throughout their wonderful summery pastel and deep tinted shades. Blended within the resin mix regards a UV stabilisation process, defending the colours from fading and surface-cracking when sunburn rays attack, resisting the demise in appearance bleaching effect endures. The beauty associated with a PVC manufacture relates to their virtually maintenance-free benefits. A light spray-hose down with water or mild detergent mixed with warm water and scrubbed with a soft brush regards their simplistic cleaning ability. Their whirlwind wash generally takes minutes to reinstate Grosfillex’s wondrous looks. PVC is resistant to weather decay, whether stood in blazing hot sunshine, downpours of rain or an abundance of heavy snowfall Grosfillex make-up is immune from deterioration and rotting therefore cost effective, requiring no future re-painting or re-varnishing conservation duties whilst their PVC manufacture is 99% recyclable delivering near perfect environmentally friendly credentials. Peace of mind regarding serviceability, construction and manufacture is delivered by a 10 years Grosfillex limited warranty guarantee. All sheds and summerhouses within the Grosfillex range have an impressive roof structure, a nice angled pitch delivers an effective yet immediate rainwater drainage system whilst the lavish overhang the roof has extending beyond the facade averts any possibility of rainfall entering in where the walls adjoin. The roof’s manufacture regards twin lined PVC panels similar to the wall’s make-up. Each roof sheet secures around a metal framework that’s further reinforced by a central ridge beam running across the internal section of the apex peak in addition to robust triangular supports securing the front & back fascias to the roof panels and roof ridge providing overall well bolstered support. The same resistance to weather decay advantages the walls possess equate to the roof panels. Unlike the quick demise in structural format roofing felt succumbs to when affected by damp conditions, PVC is not affected by cold, heat or wet conditions. Grosfillex sheds and summerhouses immunity from weather deterioration delivers the requirement we’re all searching for nowadays, no future re-roofing projects. Once the foundations are prepared, your choice of flooring is laid and the shed is assembled, customising the interior relates to either turning it into a home office space, a peaceful art studio, a luxurious she-shed space deigned into the perfect escape route away from busy home-life surroundings, maybe a games room for the kids, a man-cave for the grown up kids, a dining kitchen to assist BBQ services or simply the traditional services a utility shed harbours such as gardening equipment and outdoor gear. Stacking boxes, stand-alone shelving or office shelving units suit a whole host of storage services to accommodate requirements. Hanging items on the walls is also catered for with the Grosfillex Mounting Kit. Each kit contains six sections that secure within the vertical metal struts supporting the wall panels. Whether shelving is required or hooks to accommodate tall items like long handled gardening tools & coats etc or wishes are to hang pictures to customise your own personal space, screws can be screwed in to accomplish all these tasks. Sturdy doors open into all Grosfillex sheds, they all contain windows in different styles dependant on the model of shed to allow daylight to bask the interior. Like home-from-home a traditional handle operates their opening mechanism whilst a key locks the doors providing security when unoccupied. Grosfillex sheds vary whether windows are incorporated into the facade. Utility sheds are absent from windows in the facade to increase their storage potential for gardening services and outdoor equipment etc. On the other hand, if the popular services regarding a chalet dwelling, summerhouse, home-office, art studio or games room situated at the bottom of the garden, additional integrated windows in the shed facade illuminate daylight to the interior whilst dependant on shed model, some windows have an opening feature to deliver fresh air. Air-vents are built-in to the internal sections of the facade in several places. Generating fresh air current they eliminate any notion of a sweaty plastic environment whilst eradicating problems relating to condensation building up and dripping on the inside, a particular problem inherent with metal sheds. Rather a fresh ambience is created through the well ventilated Grosfillex sheds and summerhouses, aiding to deliver a pleasurable internal environment to your private space. Grosfillex PVC sheds and summerhouses incorporate a slightly different roof design in comparison to the majority of quality plastic sheds containing their steel truss systems and translucent skylight strip embedded within the apex roof ridge. With intentions to create the perfect unobtrusive expanse of summerhouse ceiling height delivering a more light and airy feel, rather than being obstructed with steel beams stretching out across the apex width, the main roof support regards their roof ridge to where the roof framework adjoins hence Grosfillex sheds are absent from a skylight. Instead, larger more homely windows built into the facade and windows in the doors deliver an abundance of daylight to the interior. A wonderful homely design feature. Before I leave you swimming in your creative juices designing your own garden’s luxurious retreat, here’s one of Grosfillex’s most popular summerhouse creations to provide more inspiration. 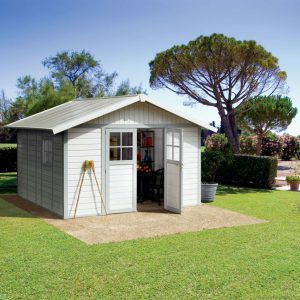 Sherwood Deco Garden sheds are manufactured in 2 sizes, a 7.5 m² model and the larger 11 m² shed. Exhibiting the most sublime pastel shaded light oak appearance incorporating fine details of a wood grain semblance running through the exterior due to technical advancements regarding heliographic printing within the molding procedure. Notice how Sherwood Deco shed’s internal image presented here shows the spacious roof expanse creating a bright and airy internal environment due to the absence of a steel truss system, a cleverly designed summerhouse. 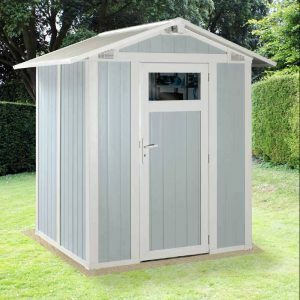 Sherwood sheds are manufactured like all Grosfillex summerhouses, requiring no maintenance apart from a wash down every now and again once the grime starts to appear whilst designed with the same construction and composition as described within this post they deliver a robust build quality. As far as looks perceive, do comparable sheds and summerhouses portray any more attraction for a garden setting? Sherwood’s are simply stunning! What Name would you give your Summerhouse? Grosfillex sheds exhibit sublime appearances for garden locations from the small garden shed to their spacious summerhouses. The weather-resistant PVC facade make-up provides virtually maintenance-free benefits thanks to new-age resin designs able to withstand weather deterioration whilst creating pure style, enclosing the sheds in an effortless-to-clean surface. Construction-wise, Grosfillex sheds assemble into sturdy lockable robust units once clamped down onto the foundations whilst additional anchorage enables reinforcing the sheds to cope with exposed areas. Their 10 year limited manufacturers warranty delivers peace of mind. A bright and airy interior throughout the Grosfillex range creates the perfect opportunity to design one’s own personal garden escape aided by mounting kits to hang art work delivering exclusivity to devise your own unique garden-room creation outside the home. 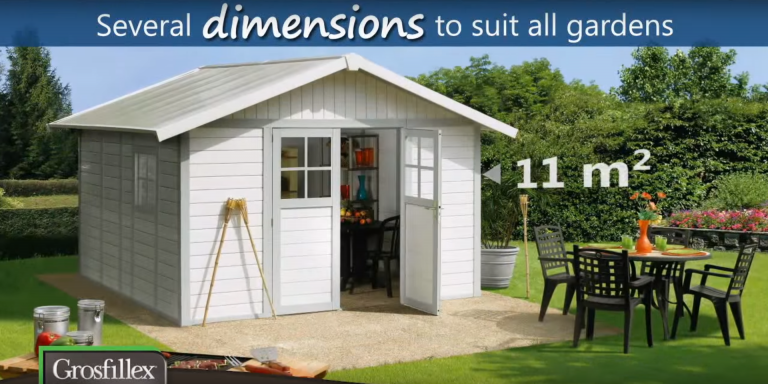 Thanks for reading about Grosfillex’s quality range of PVC storage sheds and PVC summerhouses. If you have any questions relating to PVC manufactured garden escapes, please ask in the comment section below. 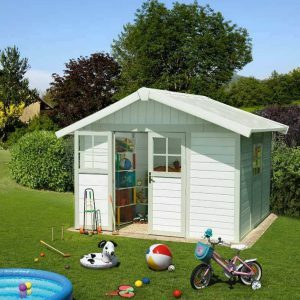 These PVC storage sheds are adorable. The summer houses look like you could live in them. I like the white with light blue trim. I think it is great that they have windows for light and that they are vented for air circulation. I can see that they would be easy maintenance and I like the 10 year guarantee. Your post made me want one so badly; but I don’t think I can afford one…and it is more a want than a need. I have a pretty large shed that holds all my extra stuff. I would like to have one just big enough to put the lawn mower and garden tools in closer to the house though. But…sigh…I have bills to pay. Aren’t they just adorable, Grosfillex describe them as a chalet at the bottom of the garden. The pastel shade colours are a popular choice due to their summery display. Instead of steel truss systems spanning the internal width supporting the roof whilst embedding a skylight, Grosfillex take another route where their main support is the roof ridge therefore absent from a skylight. Designing a roof this way brings such a homely spacious ceiling height that’s ideal for converting into your own personal space. To deliver an abundance of daylight, Grosfillex incorporate larger windows in the wall and doors, a clever design. The deliverance of air circulation is an important factor during summer periods, preventing condensation build-up and a sweaty atmosphere developing. Their 10 year warranty and superb feedback does provide confidence in their quality. Yeah, some of these large sheds are quite expensive and you do require garden room to erect their size however their are alternative smaller Grosfillex sheds that fit a more reasonable budget and smaller plot size, take a look at the prices section within the review, maybe there’s an alternative solution within a Grosfillex designed summerhouse. Thanks again Jeannie. Hope I have provided inspiration. Holy cow! This is amazing. I’m a sucker for those tiny home shows and I couldn’t help but think about that while I read this post. You really gave us a thorough insight into the pros and cons of this product. I love the fact that the floor type is completely up to you. I’d love to see more examples of flooring choices other people have made. Do you know where I could find more pictures of finished projects? 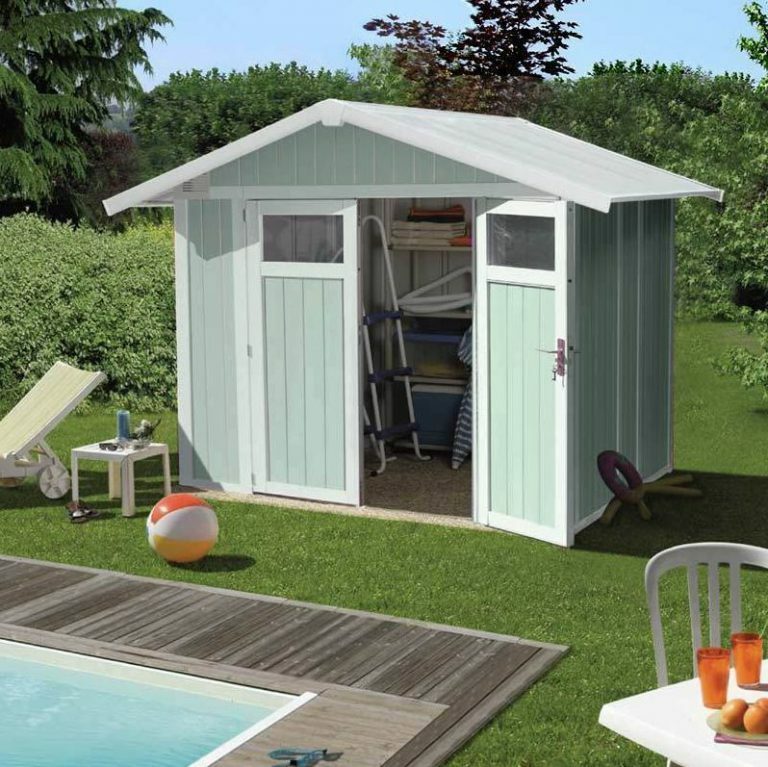 Thanks for reading about these PVC Sheds and Summerhouses. 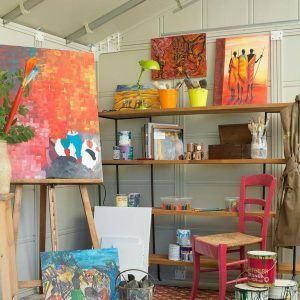 We are guilty of watching home make-over TV shows and Grand designs too, they provide so much inspiration and ideas what can be accomplished within your own personal home-space. Without doubt, Grosfillex pros are definitely their weather-resistant and near maintenance-free facade that’s a doddle to clean and maintain their shine. The cons regarding a plastic style shed used to be the glossy cheesy look to their finish however times have moved on this last few years, there are some extremely stylish designs developed through new techniques in molding procedures and printing processes nowadays, just like what Grosfillex have delivered here – pure style. Yeah most quality resin sheds incorporate a floor which is an advantage for gardening services however not totally suited for living accommodation. Grosfillex design their sheds for fitting your own floor with a manufacture to coincide with your intended services and style therefore you are able to choose the floor-colours to blend in with the accents of your surroundings, like seating, equipment, kitchen, etc. I have been looking for more additional interior images too however I have come across two Grosfillex stories which maybe of interest. The Grosfillex video up-above provides more interior inspiration. Thank you for the thoughtful reply. It’s nice to get responses from website owners. The internet isn’t always the friendliest of places. The links provided above took me to 404 pages. Could you help out there? Thank you again! Thanks for letting me know. From my end the links go straight through to the web post. Not sure why this is the case. I had no idea that you could do so much with a PVC structure! I love the looks they offer and they look to be very study structures. The question I have regarding these buildings has to do with repair. I’ve worked with wooden structures all my life, but not much with PVC. How easy is it to fix a hole if one were to appear? Do you have to replace that part, or is it pretty easy to fix? Thanks! Great looking site! Thanks for reading about Grosfillex’s PVC storage sheds – PVC summerhouses. Haven’t technical advancements evolved over recent years regarding resin manufactures, molding procedures and printing processes in the way their structures are composed. 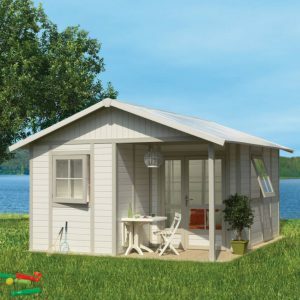 There’s some extremely stylish constructions of resin sheds and summerhouses entering the market recently, consisting of sturdy build quality, integrated weather defence with an easy to clean surface. You would have to have one mighty fine accident to break the structure of a dual line PVC facade panel however in order to fix a hole within a resin structure I can only presume you replace the panel, similar to wooden panels with wood rot, they require replacing. Regarding replacing a panel, the screws would need to be unscrewed from the vertical metal struts, slid out of position and replaced with a new one and secured in place however the roof panels would need to taken out of position first as they are secured on top of the facade panels. Quite a big job, but can be accomplished within a day I would imagine.